Did you know that the DIP SIP is the most efficient way to invest in the stock market? We at JainMatrix Investments recommend investors to invest in equities in a Direct Equity – DIP SIP mode. The equity markets have fallen sharply this year, and this is a good time to invest. Let us explain this process. A Systematic Investment Plan or SIP is a smart mode for investing money which allows you to invest a certain pre-determined amount at regular intervals (weekly, monthly, quarterly, etc.). A SIP is a planned approach towards investments where the saving habit becomes a routine. The SIP approach can be used for any investment vehicle, such as FDs, MFs, direct equity, etc. Historically investments in equity stocks have given higher returns amongst all the other asset classes if investment was done with discipline and a long term time horizon. 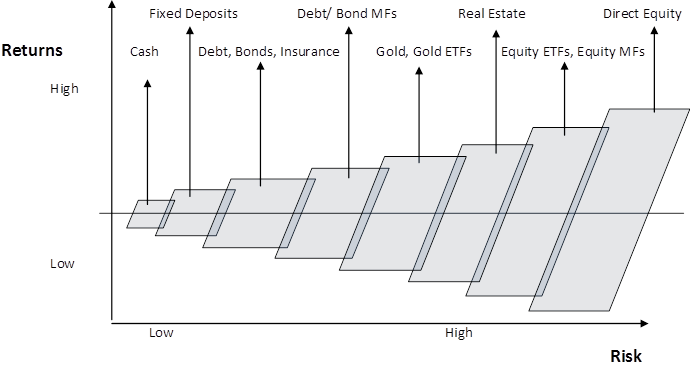 See an assets map where we present a number of asset classes and the Risk-Return trade off, Fig 1. What are the benefits of an equity SIP? Timing the market is not necessary. But gains are best when markets are low. JainMatrix Investments launched its Large Cap Model Portfolio in Dec 2012 and its Mid & Small Cap Model Portfolio in Feb 2013. These two portfolios are chosen from over a 100 stocks that we have researched over the years. The main reason for two separate model portfolios is to offer simple investment choices, and to align with the risk appetite of investors. The Large Cap Model Portfolio consists of 7 stock picks from 7 different sectors. The firms chosen are identified as high potential large caps with good fundamentals. The minimum investment period is 2 years. The objective is to outperform the Sensex/ Nifty by 5-10%. The 7 stock picks from the Mid & Small Cap Model Portfolio are from 3-4 high potential sectors. These firms have very good growth potential irrespective of mid, small or micro size. The minimum investment period is 1 year. The objective is massive out-performance of Mid/Small cap Indices. Now that you have understood the equity SIP mode of investment, it is imperative to compare DIP SIP – investing directly in equity with equity Mutual Funds. Investments in equity Mutual Funds are expensive in terms of the expense ratio cost incurred to the investor. Expense ratio states how much you pay a MF in percentage term every year to manage your money. This includes the fund management fee, agent commissions, registrar fees, and selling and promoting expenses. The Expense Ratio that is disclosed every March and September as a percentage of the funds net assets. As you grow your investment portfolio over the long-term, a high expense ratio will eat into your returns through power of compounding. The expense ratio of debt MF’s is typically in the range of 0-1% whereas it is in the range of 1-3% for equity MF’s. See Fig 1. In comparison to this, the JainMatrix Investment Service has a fixed/ flat annual charge. Now let’s have a look at various index returns, top performing large, mid & small cap MF’s and the performance of JainMatrix Investments model portfolios. 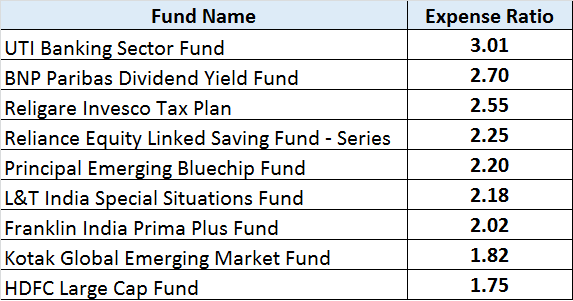 The best performing large cap MF over a 3 year period is Birla Sun Life Frontlife Equity Fund which has given investors a 13.7% simple annual returns. In the same period the SENSEX has given investors a simple annual return of 7.27% and JainMatrix Investments Large Cap Model Portfolio has given a simple annual return of 13.3%. Let us understand this graphically in Fig 4. The best performing Mid-Cap MF over a 3 year period is UTI Mid Cap Fund with a 28.08% simple annual returns. In this period, the S&P BSE Mid-Cap gave returns of 17.14%. The JainMatrix Mid & Small Cap portfolio gave a simple annual return of 47%. See Fig 6. Investors in MFs hand over the investment performance to the portfolio management team of the MF. They can now decide only to buy, hold or exit. However in the case of the JM Model Portfolios, investors retain control over the purchases as the investments are in their own trading/ demat accounts. This offers additional flexibility to investors for both entry and exits. Liquidity is the investors ability to encash in the case of urgent need for money. MF’s can be closed ended MFs that will be locked in until maturity thereby removing chances of liquidity during the investment term. Thus if an investor wants the money immediately, then he/she would have to pay an exit load for the same which is again 1-3% of the invested amount. ELSS MFs are locked in for 3 years. Direct equity is very liquid as within 2-3 days the stock can be sold and the cash credited into the linked bank account. However from a tax perspective, the treatment is the same for direct equity and equity MFs. Long term capital gains kick in after 1 year of investing. How to execute a DIP SIP? You can use your current Online Trading account/ broker relationship for the DIP SIP. If you have to choose among your broker options, choose the one with lower brokerage or better ease of use. Decide on the 5-7 stocks you will invest in. Decide on the amount you will invest every month – here I would suggest you fix an amount in the range of Rs 5,000 to 50,000 and keep up this amount every month. Thumb rules here can be 10% of your take home salary or 50% of monthly savings. Create a small calculation excel for helping you decide the actual number of shares to be bought. See section – Start Investing. Decide a date for investing. If you are salaried, perhaps 2nd or 3rd every month is a good date as it is right after you have received your salary. Or any other convenient date. Keep a reminder for this. For a high stability low risk portfolio, choose large liquid blue chips. They should be Nifty/ Sensex stocks. You do not want too much volatility in this investment. For an aggressive higher risk portfolio, choose mid & small cap stocks with high potential. You are now on the day you are starting your DIP SIP, within trading hours. Choose your DIP SIP portfolio of stocks. Lets say you chose the top 5 shares by mkt cap. Lets say you have chosen the amount Rs. 30,000 to be invested every month for your DIP SIP. Create a small excel – which can help you calculate the number of shares right now. See fig 7. Open the excel, do the calculation; then buy the DIP SIP through your broking account. Your DIP SIP can be done in 10 minutes every month. Start your DIP SIP today. Subscribe to the JainMatrix – Investment Service to get our top performing Model Portfolios and recommendations and you are ready to go. This document has been prepared by JainMatrix Investments Bangalore (JM), and is meant for use by the recipient only as information and is not for circulation. This document is not to be reported or copied or made available to others without prior permission of JM. It should not be considered or taken as an offer to sell or a solicitation to buy or sell any security. The information contained in this report has been obtained from sources that are considered to be reliable. However, JM has not independently verified the accuracy or completeness of the same. Neither JM nor any of its affiliates, its directors or its employees accepts any responsibility of whatsoever nature for the information, statements and opinion given, made available or expressed herein or for any omission therein. Recipients of this report should be aware that past performance is not necessarily a guide to future performance and value of investments can go down as well. The suitability or otherwise of any investments will depend upon the recipient’s particular circumstances and, in case of doubt, advice should be sought from an independent expert/advisor. Punit Jain has applied for certification under SEBI (Research Analysts) Regulations, 2014. Any questions should be directed to the director of JainMatrix Investments at punit.jain@jainmatrix.com . JainMatrix Investments presented the Mid Cap Model Portfolio in Feb 2013. Its time to review the portfolio, understand the changes in this period, and continue with our planned investments wherever appropriate. We are glad to note that this portfolio has outperformed the Indices in this short period. To read this valuable report, you need to subscribe to JainMatrix Investments. Visit Subscribe. On this link, check the details and Subscribe to this website to receive valuable reports directly delivered to your Inbox. JainMatrix Investments has analyzed over 52 shares over the last year and a half. In depth studies were done on 24 or so, and the performance of recommendations has been excellent. The top 10 recommendations of JainMatrix Investment Advisory Service gave an annual return of 78%, see LINK. However, good stocks oscillate about their fair value like pendulums, even as their fair value appreciates over time. It’s valuable to investors to buy shares available at the lower end of this oscillation and sell after a period, profiting from both oscillation and fair value appreciation. JainMatrix Investments presents a Midcap Model portfolio for Investors, chosen on this basis. This portfolio is recommended for a minimum holding period of 1 year. Seven (7) stocks are recommended, and will be tracked with updates on a monthly basis. The portfolio has Mid to Small cap, highly rated, quality firms that are expected to outperform over the next 1-3 years. Investors can buy this aggressive portfolio for medium term gains. Try to use only spare cash for this, and be ready for some occasional surprises both ways.